The Picasso Museum has one of the most extensive collections of works from the famous painter, taking you through the story of his life and career. The museum is housed within five attached medieval palaces, so if art isn’t for you, you can still enjoy the scenery. Go on a Sunday afternoon – Admission to the museum is free on the first Sunday of every month, and is free every Sunday after 3pm. Jewel yourself Picasso style – Head right around the corner of the museum to BCN Art Design located on Carrer de la Princesa. This tiny jewelry store carries a unique line of jewelry designed in Picasso’s signature style. It’s a great place to pick up souvenirs or a little something for yourself. 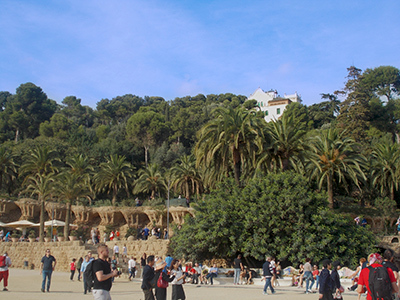 Barcelona has some of the best beaches in Europe, and whether you’re looking to relax by the water or meet fellow beachgoers, there’s something for everyone. 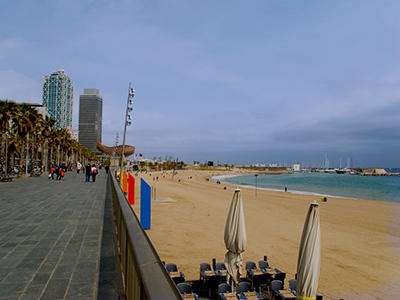 One of the most famous is Barceloneta, where the music and the mingling make for day time fun. Go early – The beaches tend to fill up very quickly. Go early and make sure you beat the crowds and get your spot of choice. Pack your suit, even in the fall – With the high temperatures Barcelona normally experiences, don’t be surprised if you find yourself hitting the beach in October. Pack your beach gear even if you’re travelling in the spring or fall, the sun may surprise you. La Rambla is one of, if not the most, famous streets in Barcelona. Lined with shops, kiosks, restaurants, and tourists, it’s almost like walking through an outdoor mall. It can be extremely crowded, especially during peak season, but a walk down La Rambla is necessary to complete your trip to Barcelona. Explore the side streets: Venture off the main road to the rustic side streets, where you’ll find more shops and the entrances to markets and squares. Watch for pickpockets: With the abundance of crowds and tourists, be weary of pickpockets on La Rambla. Keep your bags in front of you and in sight at all times to avoid it. As you’re taking a stroll down La Rambla, you will most likely notice an entrance for a food market – go in. This is La Boqueria, one of Europe’s biggest and most famous food markets, where you will find an endless amount of fresh fruit, vegetables, seafood, meat and more. Go early – The best time to go to the market is in the morning – it’s less crowded and you’ll get first pick at the freshest selection. It’s closed on Sundays, so plan accordingly. Pack a picnic - The foods at the market are perfect to take to one of the local squares, beaches, or parks for a picnic. It’s a more laidback and affordable alternative to eating at a restaurant every day. Sorry vegetarians, you may want to skip this section. For you meat lovers, the Iberian ham (or jamón ibérico) is a must try. What can be best described as Spain’s version of prosciutto, this cured meat can be found on the majority of menus in a variety of dishes across Barcelona. Get Iberian Ham to go – Right at the entrance of La Boqueria you will find Tocineria Marcos – a butcher stand where you can buy a fresh serving of sliced Iberian Ham in a paper cone. It’s Barcelona’s version of buying a hot dog on the street – and is melt-in-your-mouth delicious. 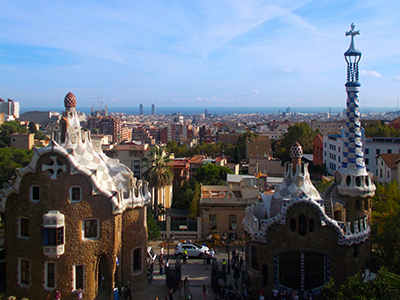 It’s impossible to visit Barcelona and not see Gaudi’s architectural impact on the city. From the incomplete basilica Sagrada Família to the Dr. Seuss like garden complex Park Guell (both of which are a must see), Gaudi’s unique architectural style is a footprint of the city – explore as much of it as you can. Choose your interiors ahead of time – Keep in mind that while you can admire the beautiful exteriors of all the Gaudi attractions at no cost, most require a (sometimes significant) fee to enter. Research ahead of time which ones you want to see the inside of to avoid being indecisive in the moment. If you want to see them all, consider taking a Gaudi bus tour, where you can gain entrance and transportation for one fee. Also off La Rambla is the Gothic Quarter – the old city of Barcelona with buildings that trace back to the Middle Ages. Get lost in the haunting architecture, winding roads, and hidden squares. There’s a lot to discover, so take your time and explore. Join in on the dance: If you’re in the Gothic Quarter on a Sunday, look out for people doing the Sardana dance – it’s the national circle dance of Catalan culture. It is mostly locals dancing, but tourists are welcome to join in on the fun. 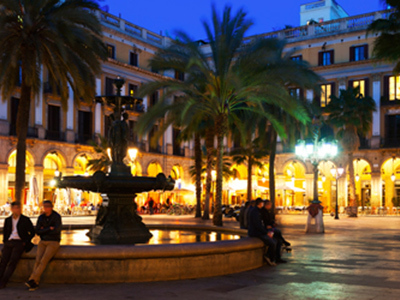 Placa Reial is Barcelona’s biggest square, lined with restaurants and some of the popular nightclubs in the city. It is lively at all times of the day, and is lined with palm trees (yes, palm trees!) giving it a tropical, outside-the-city vibe. Pay attention to the lampposts – they were one of the first architectural works Gaudi completed after graduating. Go at night – Even if it’s not to go to the nightclub, swing by the square at night. It has the hustle and bustle of a night out, but you can sit back on one of the patios, relax, and enjoy some tapas. It’s also a great spot for people watching. Barcelona is a lively and colourful city in so many ways, so it only makes sense that the nightlife follows suit. There is something for everyone – salsa dancing, lounges, and electronic dance clubs. In general, the party starts later and ends later than it does in North American cities, so plan your night accordingly. Watch true mixologists at work - The bartenders at Espit Chupitos do more than just make your drink – they put on a show. Stop in to watch as they light drinks on fire or roast marshmallows over top them – it’s an entertaining and delicious experience. One of the best things about Barcelona is its size – big enough that there’s a lot to see, small enough that if you’re up for it, you can do it all on foot. There is a pretty intricate metro system to help in case your feet start to give out, but try and walk to your destinations as much as you can. There are so many gems hidden in the narrow roads – along the way you will be sure to discover things that aren’t on your map, giving you a true taste of the city. Wear comfy shoes, drink water and carry a map – All the things you need for a successful walking tour around any city.